Hello Elaina. Thank you so much for inviting me to feature on your lovely blog and write an indulgent few words on something I am particularly passionate about. I must admit I thought long and hard about what I could wax lyrical about and I’ve settled on… social media. Now I can hear some of you groaning already but love it or loath social media is here to stay and for us authors it now forms a huge part of our marketing and promo experience so I urge you to get to grips with it, embrace it and above all, enjoy it! Personally, as a relentless chatterbox, I love the online author experience and blog, tweet, post to Facebook, Pinterest and Instagram on a regular basis. The opportunity to engage and network with authors all over the world from the comfort of my sofa is fantastic but even more thrilling is the chance to make that connection with readers! 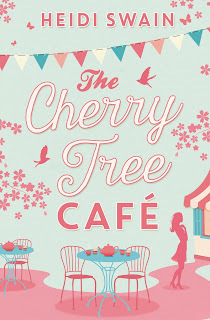 My debut novel, The Cherry Tree Café, was published this summer and as you can imagine I was jump up and down excited to finally secure that deal, bag myself a world class publisher, stunning book jacket and fizz filled launch party however, exciting as all that was, reading reviews and readers’ comments and experiences has surpassed all expectations. The thought that my novel is someone’s bedtime read, holiday read, even a welcome distraction on a monotonous journey is an absolute joy and the fact that these fabulous readers are prepared to tell the world about it through the means of social media is even better! However, even though this is all hugely exciting it is important to remember to play by the rules if you want to make the most of your online presence. No-one is interested in a continual hard sell, the whole ‘buy my book, buy my book!’ frenzy simply drives me and everyone else on the planet to distraction and it doesn’t work to boot. Of course around publication time you need to be promoting and sharing but what about the person behind the pages? That’s who readers and the world in general is, in my experience, really interested in. Who is the person behind the keys? What makes them tick? Social media gives us the opportunity to form relationships with people we quite probably wouldn’t have any chance of meeting in ‘real life’ so set up that account, share crazy cat pictures, gardening triumphs, craft projects and bake fails and prepare to make friends and have your horizons broadened! DO NOT – Pitch to a publisher, agent or other via social media. I know, but it does happen! Well I guess that’s it. I hope my few words have encouraged you to make the most of the online author experience. I look forward to connecting with you soon! Oops I meant Bob cat! Excellent! Looking forward to seeing Bob in action! Thanks Wendy, looking forward to seeing the photos & thanks to my wonderfully informative guest Heidi! Thank you for inviting me! It was a fun post to write!